Getting Dental Implants in Westmont? Learn All About Them Today! Thanks to advanced technology and the evolution of dentistry, replacing teeth has become easier and more effective than ever before. Especially when you’re discussing dental implants in Westmont with your dentist. If you’re considering getting this form of restorative dentistry, you’ll probably want to know exactly what it entails. Learn all about dental implants in this week’s blog post. The main part of dental implant is a small metal screw or post that’s crafted from high-quality, biocompatible titanium. These posts are to be placed directly into the jawbone, making dental implants the most stable, long-lasting dental restoration available. Creating this solid foundation is essential to a successful dental implant and permanent tooth replacement solution. 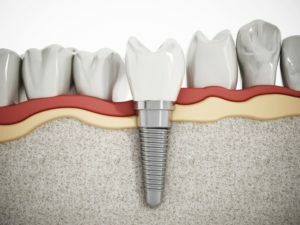 After the post has healed and properly fused to the jawbone during your healing period, the second part of your dental implant restoration is attached: the abutment. This piece acts as a connector between the post and your dental prosthetic to replace the crown of your missing tooth. During the final phase of placement, a replacement tooth is designed to meet your tooth loss needs. This replacement is known as a dental restoration or your personalized dental prosthetic. There are a few different kinds that serve different purposes. For instance, if you just have a single missing tooth, your dentist will only recommend attaching a single dental crown. If you have consecutive missing teeth, your dentist will recommend a dental bridge. In the case that you have a severe case of tooth loss, you can explore implant retained dentures (full or partials). Getting dental implants is easier than you may think. Although you’re required to get oral surgery and undergo a time of healing before your teeth are restored, the entire process starts with a simple dental visit. Your scheduled consultation will determine the details of your implant placement and how quickly your dentist in Westmont will be able to help you. It’s time to schedule a consultation with your dentist to see if dental implants can work for you! Are you looking for a practice that will be there for you throughout the duration of your dental implant placement? Look no further than the dental office of Dr. Hong and Dr. Lam. Our dental experts work to keep our patients mouths in great shape and will repair them if they have a problem like tooth loss. Call us today to schedule your next restoration consultation. Comments Off on Getting Dental Implants in Westmont? Learn All About Them Today!